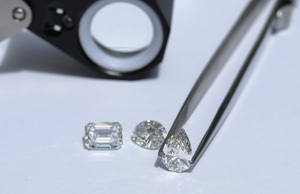 The international roundup of jewelry and watch experts welcomes Ada Diamonds, as the industry grows in innovation, style, and acceptance of Lab-Grown Diamonds. Navigating the optical illusion that effects set vs. unset diamonds. Can you tell if the loose lab grown diamonds are larger or smaller than the lab diamond stud earrings?